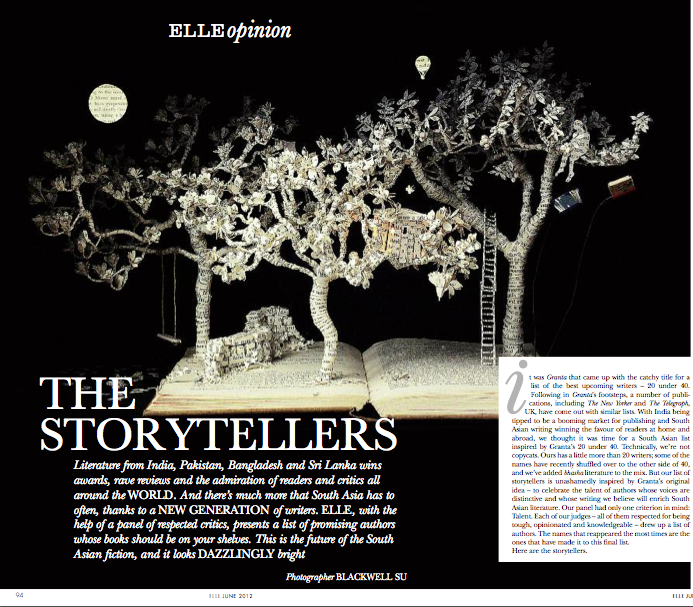 In the June issue of ELLE India, there’s a story listing the best of upcoming South Asian authors. Inspired by Granta’s 20 under 40, the book enthusiasts in ELLE thought it was about time that there was a desi equivalent, so we got in touch with some of the sharpest reviewers in the business and with their help, emerged the list you see in the article titled “The Storytellers”. I’m among the people who worked pretty hard on this and I’m very happy with how it’s turned out, particularly because ELLE took the effort of including bhasha literature as well. I’m not going to put up all the text — too long — but here’s the introductory paragraph and the names. Pick up the magazine to see what they’ve written and why they are the great brown hope. Thanks again to Faiza S. Khan, Gaurav Jain, Nilanjana Roy and Trisha Gupta for being on the panel of judges. It was Granta that came up with the catchy title for a list of the best upcoming writers – 20 under 40. Following in Granta’s footsteps, a number of publications, including The New Yorker and The Telegraph, UK, have come out with similar lists. With India being tipped to be a booming market for publishing and South Asian writing winning the favour of readers at home and abroad, we thought it was time for a South Asian list inspired by Granta’s 20 under 40. Technically, we’re not copycats. Ours has a little more than 20 writers; some of the names have recently shuffled over to the other side of 40, and we’ve added bhasha literature to the mix. But our list of storytellers is unashamedly inspired by Granta’s original idea – to celebrate the talent of authors whose voices are distinctive and whose writing we believe will enrich South Asian literature. Our panel had only one criterion in mind: Talent. Each of our judges – all of them respected for being tough, opinionated and knowledgeable – drew up a list of authors. The names that reappeared the most times are the ones that have made it to this final list. Here are the storytellers. Hi. What about the Elle Fiction award? Any idea when it will be announced? The winners have been announced in the June issue. Oh. Can I see the list online somewhere? Don’t think so. ELLE India’s content isn’t available online. Is this list politically correct. Are OBCs, SC/ST, religious minorities adequately represented in this.Otherwise be prepared for a deluge of protest from the politically correct intellectuals. Or is that some like Meena Kandasamy have been included exactly for that reason. Your comment, with its insinuation regarding Meena Kandasamy, is the first that I’ve seriously considered trashing as Spam. However, I’m going to be better person and simply say that, as mentioned in the quote from the article, the list is based on talent. oh, it is indeed fabulous achievement for upcoming writers that to women writers,I hope think that regional lit writers in marathi, kannada ,telgu are brought to the fore. we don’t have good translators as Marquez, Lossa and latin american writers have! Are they Indian Writers in English? I see many names from Bangladesh, Sri Lanka and Pakistan, don’t I? Hence the introductory paragraph quoted from the magazine, which clarifies the list is for South Asian writing. I’ve changed it in the heading I gave in the post too, since clearly there must be others like you who may not read the actual introductory paragraph and only read the sum-up. They may have Indian publisher, but I am afraid that is not enough.